wk dir: Working directory to save intermidiate files. By default is set to the current directory. data dirs: directories of each subject, can be input from an SPM input dialog of directories or from a *.txt file filled with one directory at a line. filetype: Initial filetype for processing, normally wildcard after DICOM conversion. The item can update itself after each process. 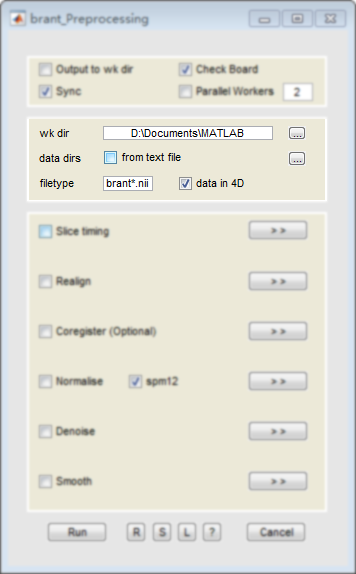 data in 4D: Checked means input data is in 4D format, which is highly suggested. If 3D file format is used, each subjects directory will have up to thousands of files after process.